It’s artistic as hell, but that’s hardly enough when the story keeps getting more dull, and leaving behind whatever was working for it, as the movie goes on. This is a great looking movie with an enjoyable enough premise until it goes sour at about the halfway point. Sure, it’s the rise and fall story of a guy who had a lot going on and then threw it all away, and sure, we’ve seen that before and had a problem with it, but here, things are a little different. For one thing, there really isn’t a rise. At the start of the movie, rusty james is on top of his game. We don’t watch him rise to success, he’s already there. He’s the leader of a group that follows him to a fight. He’s got a beautiful girlfriend. And when his older brother, the motorcycle boy, comes back to down, it all starts going downhill. The scenes in the diner are the ones that work best in this movie, probably because they are the most laid back and also the most filled with conversation. They are also the few scenes where Mickey Rourke’s character is nowhere to be found. All the other scenes appear to be based around Rusty James idolizing his deadbeat older brother, and that leads to the movie becoming pretty dull itself. 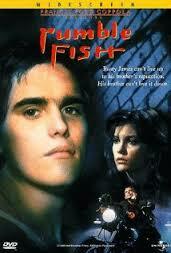 Rumble Fish is interesting. it’s an incredibly artistic movie, filmed in the kind of black and white that makes you treasure every frame. and as far as subject matter, this is about young rough necks on the streets. It’s the outsiders meets west side story meets rebel without a cause. and not a one of those movies was made in black and white. I suppose it goes for the last picture show with that one, and gets a little bit of each film in there, trying to combine them all into a way that says everything at once. With so much ambition, and so little originality, it’s no wonder the film doesn’t really work. Director Francis Ford Coppola with a very specific vision created the movie, and if not for a rather dull second half, he would have probably succeeded. Rusty James is the guy in charge these days, with a girlfriend who is the most attractive girl in town (Diane Lane), and a bunch of friends who would follow him into battle at the tip of a hat. They do just that in one of the earlier scenes of the movie, when rusty James goes after some other kids who are causing problems in an underground garage, and finds him getting stabbed. This scene is very reminiscent of the garage fight in west side story. that’s when the motorcycle boy shows up. Mickey source’s character is a legend between rusty James and his friends, but he’s notorious among the police who cherished the day the motorcycle boy skipped town. They hoped to never see him again. Now that he’s back, everyone is on high alert, knowing they have to watch what’s happening on the streets a little more carefully. Rusty James is injured after the stabbing, and it takes some time for him to recover. when he does, he goes to a house party and gets it on with another girl there. His girlfriend gets word of this and dumps him pretty quickly after that. This is the start of rusty James’ downfall. Instead of his friends, he starts hanging out with his older, degenerate brother, and this only leads to more trouble. Rusty James has a conversation with a girl who has been hanging out with his brother, and can barely stomach talking to her. He can’t believe his brother, who he idolizes, would go for such a low class girl. then the two of them go to see their father, and things only get worse. this older man, played by Dennis Hopper (who was also in Rebel Without A Cause, when he was a kid,) is a complete drunk who doesn’t know which end is up. all he cares about is the bottle in his hand and at one point when rusty James tries to take it from him, in a joking way, the father gets way too serious way too fast. the second half of the movie is plagued with depression and downfall, the way the second half of lots of movies are. The first half is always about the success and glory, and then the second half is where everything falls apart. From Goodfellas to Boogie Nights, it’s always the same, and some movies (like those two), does it better than others. here, things are a little different though, because the first half isn’t really all about that glory. There isn’t any sudden rise to success. Rusty James might start out at an all time high, but between the stabbing and his brother’s return, things seem like they might actually be creative here. The best scenes of the movie take place around a diner where rusty James and his friends hang out. This is where and he and the guys start off the movie, with a witty restaurant owner behind the counter commenting on what he sees happening with Rusty James and his friends. The next time we come back to the diner is at around the halfway point of the film, and it’s when we learn that the Diane lane character has not only moved on, but has done it with one of Rusty James’ most trusted friends. The climax of the movie feels right out of rebel without a cause, with one character meeting a terrible fate, and then everyone else just standing around, talking about how horrible it is. You don’t get scenes like this in movies these days. Maybe we have become numb to death, or there just isn’t enough time to have characters stand around, but while it worked in rebel, it does not really work here. That’s because rebel was a truly tragic story, where the characters were all pretty doomed from the start. here, what happens to the character kind of feels unnecessary, and like it only happened in order to give the movie a climax. There are a lot of interesting things about this movie. It is almost entirely shot in black and white, but then there are a couple of images every now and then that is presented in color. the reasons why aren’t always so obvious. One of these images is the rumble fish themselves, as they swim around a fish tank. I do like the way it tried to combine all those other great movies (the house party scene is just like the pool party in last picture show), but all those other films had much more going on then just the surface martial. Rumble Fish only takes what was on the surface. take rebel and the conflicts between the James Dean character and his parents, for example. 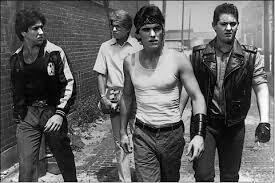 Rumble Fish is definitely entertaining, but it would have been a whole lot better had it kept up the momentum, and not started to feel like the usual downfall film towards the end.